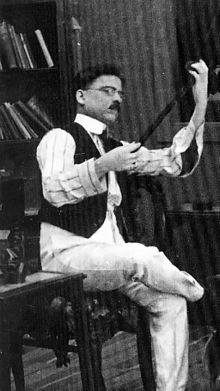 Dhundiraj Govind Phalke (30 April 1870 – 16 February 1944) was an Indian producer-director-screenwriter. He is known as the father of Indian cinema. The Dadasaheb Phalke Award, awarded to people who worked for a long time to the Indian cinema, was created in his honor by the Government of India in 1969. ↑ Vatave, Bapu; Trust, National Book (2004). Dadasaheb Phalke, the father of Indian cinema. National Book Trust. ISBN 978-81-237-4319-6. Retrieved 2012-11-17. ↑ Vilanilam, J. V. (2005). Mass Communication in India: A Sociological Perspective. New Delhi: Sage Publications. p. 128. ISBN 978-81-7829-515-2. This page was last changed on 5 February 2018, at 21:39.